This next company that I am going to introduce you to helps us to add a little bit of accessory to our wardrobe...without going too over the top. The Charm Factory is an online company that offers Sterling Silver charms, charm bracelets, necklaces and beads. These products are very nice as they are made in the USA and are also lead-free...which is so great. The inventory of the Charm Factory is huge as they carry almost 5,000 products that are high quality and simply beautiful! I have a charm bracelet myself (not from the Charm Factory) and LOVE it. It contains charms that I have collected over the years and has gotten so full it is difficult to wear (too noisy! LOL!). Charm bracelets are collectables that can be passed on from generation to generation so it is good to try to get one that will last. I truly believe that the bracelets from the Charm Factory are heirloom quality and will last throughout the years. For this review, I chose to review the Awareness Bracelet. This is a beautiful sterling silver bracelet that is a constant reminder to keep hope alive. Breast cancer is an awful disease...I have a friend who suffered through it and is going strong today...because of God's amazing grace. When you know someone who is dealing with cancer, hope, faith and love are some of the very important things that will get them through. 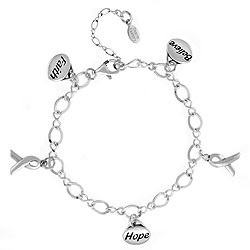 The Awareness Bracelet comes with five charms...three of them read "Hope", "Believe" and "Faith". The other two are shaped like breast cancer ribbons. It is truly a beautiful reminder for anyone to wear...especially a cancer survivor. I have a large wrist and was thankful for the extra extention chain that came with this bracelet. It looks very elegant and stylish all at the same time. Plus, it is not bulky and noisy which is wonderful. I plan to give this bracelet to my friend who is a survivor in hopes that it will continue to encourage and bless her. So, in my opinion...the Charm Factory is a wonderful company full of options when it comes to designing your own charm bracelet. The fact that the charms and bracelets are sterling silver is very nice...and makes them reasonably priced too. I am thrilled with the selection and quality and recommend this company to anyone and everyone. The Charm Factory has graciously offered to giveaway a finished charm bracelet to one of you! Here are your entry options. 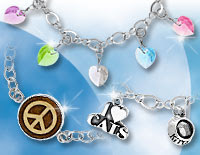 Visit the Charm Factory and tell me which charm bracelet you would choose should you win. You do not have to be a blogger to enter, but you must have a valid email where you can be reached should you win. If you do not leave an email address, it must be where I can easily find it. This giveaway is open to US residents and will end 3/22 at 11:59 pm EST. The winner will be chosen using random.org and will be notified by email. The winner will have 48 hours to respond, or another winner will be selected. 6. "Like" the Charm Factory on Facebook. 2 entries, so 2 comments. 7. Follow the Charm Factory on Twitter. 2 entries, so 2 comments. Disclaimer: I received no monetary compensation for this post. I did receive an Awareness Bracelet for review purposes. All quotes are from the Charm Factory website and email. All thoughts and opinions are mine. I think I would choose the Sapphire Crystal Heart bracelet for a friend for her birthday. I forgot to leave my email address. I would choose the silver heart bracelet. I would get the heart bracelet. The Silver heart bracelet is my fave. I would pick the Emerald Bracelet with Crystal Hearts. I "Like" the Charm Factory on Facebook. I like the star charm bracelet. I really love the Silver Star Bracelet! I think i would choose the Awareness Bracelet. I would choose the finished silver star bracelet. I like Charm Factory on Twitter (mail4rosey). I like the peace sign bracelet! thank you! I'm a facebook fan of Charm Factory! If I won, I would choose the Silver Heart Bracelet! I am a GFC follower. Entry #1. I am a GFC follower. Entry #2. I am a GFC follower. Entry #3. I like the Joyful Colors Swarovski Heart Bracelet. I would choose the Garnet Bracelet with Crystal Hearts. I like the Sapphire Crystal Heart bracelet! I Follow the Charm Factory on Twitter as jg4462. I like the Silver Star Bracelet!! I tweeted about the giveaway at http://twitter.com/likwan/status/50376528114094080. I would choose the Emerald Bracelet with Crystal Hearts.